By opening a branch office in Oakland, the Pacific Justice Institute signals its intention to become more active locally. Dacus calls the Bay Area "perhaps the most hostile place in the nation for people of faith." As the video begins, Brad Dacus stands in profile. "There was another time in history ... when the bell tolled," he declares. "The question was whether or not they were going to hear it. The time was during Nazi Germany — with Adolf Hitler." A solitary "Whoa!" rises as Dacus sweeps an arm across the crowd. "You see, he brought crowds of clergy together to assure them that he was going to look after the church. And one of the members, bold and courageous — Reverend Niemöller — made his way to the front and boldly said, 'Hitler, we are not concerned about the church. Jesus Christ will take care of the church. We are concerned about the soul of Germany. ...'"
"Hitler said, 'The soul of Germany: you can leave that to me.' And they did — and because they did, bombs did not only fall upon the nation of Germany, but also upon the church and their testimony to this very day. Let us not make that mistake, folks. Let us hear the bell! Vote on Proposition 8!" Dacus, founder and president of the conservative Christian legal firm Pacific Justice Institute, was speaking last October to a "Yes on 8" rally on his home turf of Sacramento, where his institute has been headquartered since its 1997 creation. 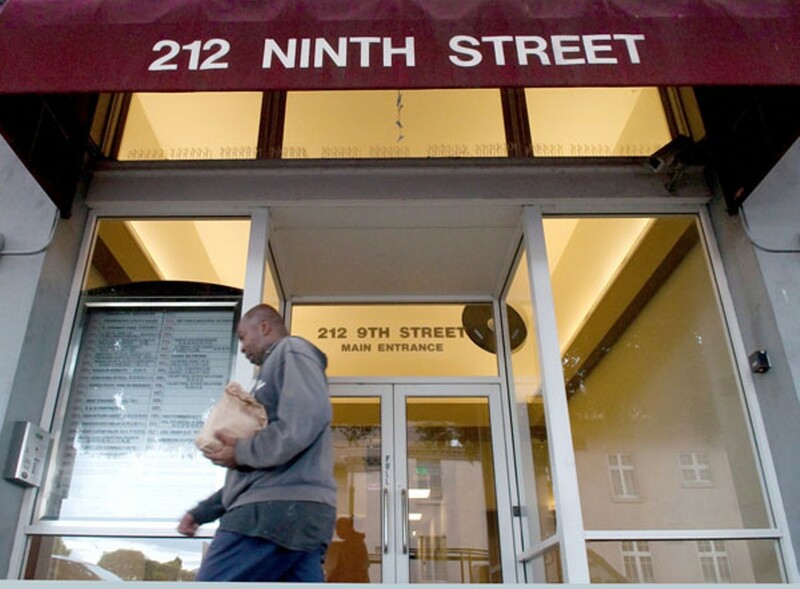 Now the nonprofit has opened a new satellite office on 9th Street in Oakland's Chinatown. From there, this self-proclaimed defender of "parental rights and religious freedom" will have easier access to the California Supreme Court, the United States Court of Appeals for the Ninth Circuit, and pro bono clients throughout the region that Dacus has called "perhaps the most hostile place in the nation for people of faith." The Oakland office represents an expansion of the institute's efforts to fight what Dacus calls "intolerance" in the region. "The increase in requests for assistance that continue to come into our office is such that a Bay Area office we found was very warranted and needed," he said in an interview. This could mean increased headaches for school districts — a favorite target in Dacus's war for "parents' rights" — and more lawsuits like the ongoing case in which the institute's client, Faith Fellowship Church, alleges that the city of San Leandro is breaking the law by not rezoning to accommodate church expansion plans. Religious convictions have compelled Dacus to take on such cases as a fight to allow Bakersfield students to opt out of a homosexual teacher's class, a tussle with a Utah public school that he claims was peddling a book "promoting witchcraft" via the Scholastic Book Club catalog, and — while employed by the conservative Rutherford Institute — the defense of the family of a teenage Nebraska boy who, with his parents' help, had his girlfriend arrested for seeking an abortion. For the courts to find in favor of the girl, Dacus told Time in 1994, would have had "a chilling effect" on free speech. The Pacific Justice Institute has been a presence in the East Bay for years despite not previously having a regional office. Calling on its network of loyal, pro-bono lawyers — Dacus claims to have more than 500 such "affiliate attorneys" in California and more than 1,000 nationally — the organization unsuccessfully took on Berkeley in 2000 over the city's insistence that the Sea Scouts, which prohibit gay and atheist members, pay rent to use municipal berths. In 2002, the institute took up multiple causes in Hayward, including the case of four teachers at Tennyson High School who refused to attend an in-service training on student LGBT concerns. In March 2009, the US Supreme Court refused to hear the institute's years-long suit against UC Berkeley, which the organization alleged was violating the First Amendment by hosting a federally funded web site featuring one page out of 840 that linked to information touting the compatibility of evolution and religion. Last month, the institute and the Castro Valley school district settled a dispute over Castro Valley High's March 2009 "Days of Diversity," a two-day program featuring topics as diverse as Vietnam veterans, children in foster care, and life as a cowboy. For the third consecutive year, the program also included an appearance by the lesbian senior minister of Hayward's Eden United Church of Christ. The institute's lawsuit grew out of a request for records relating to that presentation, which was kicked off by an anonymous mass e-mail that claimed the pastor's presentation gave "step-by-step instructions on how to become gay and transsexual." That same e-mail also complained that tolerance education overlooks the fact that "we are all mistreated everyday... The punk rocker with his iPod in his ear that gave me my coffee at Starbucks this morning mistreated me." Although ultimately Pacific Justice Institute chief counsel Kevin Snider said he was satisfied that the district had provided all requested documents, the case ended up costing the Castro Valley schools $4,807 in lawsuit-related costs. Snider, who is heading the institute's new Oakland office and calls the Bay Area a "very strategic place," said of Castro Valley: "Now that that's been settled, parents are meeting with the school officials, and hopefully they're going to start on the right foot and have some dialogue." Meanwhile, assistant superintendent Mike Bush denied that any of the 31 plaintiffs in the case were even parents of students at the high school. Such issues are of special interest to the institute and Dacus, who with his wife Susanne is the author of a book informing public-school teachers, students, and parents of "strategies to practically and legally evangelize your school." Titled Reclaim Your School, the book calls separation of church and state "the big lie" and covers everything from pastor visitations to special school-hours Bible study through which, Dacus writes, "a large number of students ... make commitments to receive Christ by the end of the year." Another passage states, "because public school employees are cautious not to display their faith inappropriately or in a manner that might violate the law, it may take a few visits or conversations before you can determine the religious or non-religious views of the staff at your public school." Dacus is a man with strong religious convictions. "I'm a Christian," he said in an interview. "My wife was in full-time youth ministry for ten years working with high-school kids. That book goes right along with my personal convictions and desire not just for religious freedom but ideally for people, for kids, to be able to come to Christ. So it's evangelical. It's a book with a definite evangelical perspective. I don't have to apologize for that because we have a society where we have religious freedom." For his institute, that freedom includes urging parents to opt out of LGBT tolerance curricula like the one adopted by the Alameda school board in May. A 45-minute-per-grade anti-bullying program that begins in kindergarten with students talking about what makes them feel welcome and unwelcome and ends in fifth grade with a discussion of the harm that stereotyping LGBT people might cause, the curriculum, "Lesson 9," is the basis for an ongoing series of lawsuits filed by the institute on behalf of parents. An effort to recall the three school board members who voted for the curriculum also is in the works, and, should supporters gather enough signatures by December, will require a special election in 2010. One of the leaders of the recall campaign, Kevin Wood, said the institute has advised his group pro bono. Snider occasionally attends their meetings, and Wood says his group is also "an avenue to reach the parents" so that more opt-out lawsuits may be filed. Wood's group, S.E.R.V.E. (Seeking Equity and Respect for all Viewpoints in Education) Alameda has suggested that its complaint is not with the LGBT anti-bullying lessons, but rather with the absence of lessons that explicitly address other groups protected by anti-discrimination laws. However, the institute opposes the inclusion of LGBT as one of those protected categories, arguing that gay, bisexual, and transgendered people can change. "While it is true that they are entitled to all the protection of due process and anti-harassment and other protection afforded to other individuals under the law," said Dacus, "that also can be problematic because there are thousands of ex-gays and lesbians in the United States that are members of Exodus International. They have spoken at assemblies and have been very outspoken." The institute has stated opposition to legislation and educational policies that would, according to various press releases, expand federal employment laws to prohibit discrimination "based on 'sexual orientation,' including homosexuality and bisexuality;" "force people to rent to people, even if it violates their conscience;" or "require all student clubs, including Bible clubs, to extend membership to students regardless of their sexual orientation or religion." According to Tony Paik, a University of Iowa sociology professor who has studied right-wing legal nonprofits, the institute is not one of the better-known groups. It's annual budget has grown from $211,645 in 1998 to $1.5 million in 2007, the last year for which data is available. Since last year, Dacus has begun two new nonprofit groups, a legislative-advocacy organization and an additional legal nonprofit. One group that has recently taken notice of the institute is the Anti-Defamation League, which released a statement last year condemning the Third Reich analogy he used in his Proposition 8 speech. "We are outraged and deeply offended that a spokesman for the Pacific Justice Institute has chosen to invoke images of Hitler and Nazi Germany as part of that organization's campaign on behalf of Proposition 8," read the press release. Asked about his comments, Dacus told the Express, "Obviously I wasn't trying to infer that anyone in the San Francisco Bay Area was akin to the Third Reich or in favor of any cause of the Nazis. That would be a ludicrous understanding of the point that was being made." Instead, he argued, the speech was an exhortation that today's church not be "silent on an issue they had a strong theological and moral conviction about." But he added: "If the purpose of that organization is to stand up to anti-Semitism, they should be glad that I was once again reminding people of the importance of people to stand up to tyranny."